He is the creator of the groundbreaking DVD series The Ultimate Yogi, co-creator of the digital series “Yoga 30 for 30,” along with many other best-selling yoga DVDs. 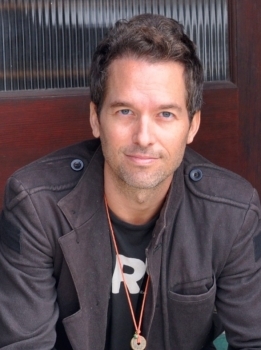 He is the co-author of a comprehensive, modern day yoga book, “Holistic Yoga Flow: The Path of Practice.” His highly acclaimed chant album, The Meaning of Soul, debuted at No. 3 on the iTunes world music chart. He is the CEO of Inner Domain Media, director of Holistic Yoga Flow teacher trainings and a member of the faculty of the prestigious Kripalu Institute and 1440 Multiversity. A Yoga Alliance-certified E-RYT 500 instructor, Travis has been featured in Yoga Journal, LA YOGA Ayurveda and Health, Mantra magazine, Conscious Lifestyle, Asana Journal, Self, Fitness Trainer, Access Hollywood, and The Huffington Post. Travis is currently writing a book on Yin Yoga. There is an art and science to crafting a yoga class that is transformative and potentially life-changing. In this immersion Travis and Lauren will share their special Holistic Yoga Flow method that has impacted thousands of students across the globe. This immersion is specifically designed for yoga teachers. Not practising Yin yoga? You and your students are missing out! After all, who doesn't want greater flexibility and less pain? An increased range of motion and less inflammation? These are just some of the reasons Yin is in such high demand now. Topics in this workshop include: the history and evolution of Yin yoga, from its roots in martial arts to present-day applications; the science of Yin yoga, including the 3 Laws of Yin Yoga; the role of hyaluronic acid in longevity; and the physical effects Yin has on the body's fascia and connective tissue. This deep, cleansing class will help restore your spine’s natural range of motion, cleanse your organs, and stimulate circulation. Remove those toxins and renew from the inside out. Challenging your balance works with both hemispheres of the brain to help you develop a sound mind, body and spirit. Yin Yoga is literally the fountain of youth. It targets the connective tissues, ligaments, and joints of the body. This is the perfect complement to vinyasa yoga and will challenge you on an entirely new level through long, deep, sustained holds. Gentle Yoga is critical to your practice to allow your muscles time to heal and repair while guiding you deeper into reduced levels of stress.